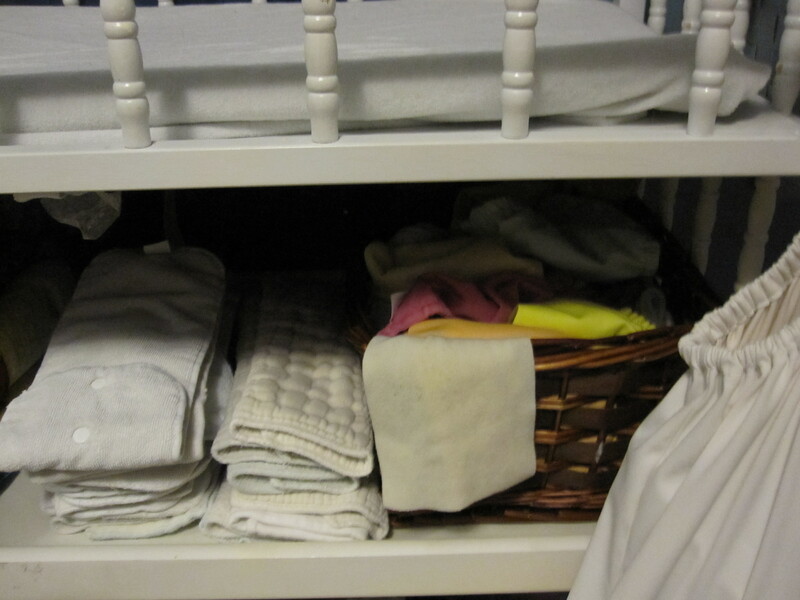 Several weeks back I was asked how I store and organize my cloth diapering items. Well, to be honest, I don’t. I can organize my finances, business stuff, grocery shopping and meal plans, but when it comes to my diapers (or laundry in general) I’m lucky if I get one step further than running down to the basement to grab a clean diaper out of the dryer for each diaper change. 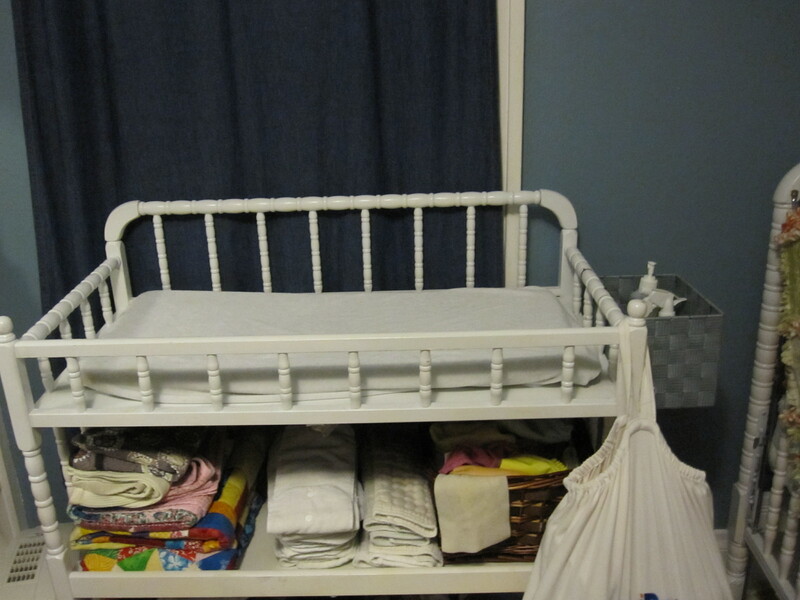 On the good days, the diapers are pulled from the dryer and the drying rack and thrown in a big pile under the changing table. There I said it! One big ball of covers, prefolds, pockets, inserts, wipes, and fleece liners that I pick through for each diaper change. It’s not pretty, or organized, but it works. One of the great selling points with cloth diapers is that you don’t have to be a laundry freak or incredible organized to do it. I’m definitely not either. Usually at my house the average 3 day wash routine gets stretched not to 4 or 5 days, but more like 6! I like to think that anyone can cloth diaper and if that means that washing every 3 days is too much for you (like it is me), buy more diapers and go longer between washes. If that makes you enjoy cloth diapering, then do it! 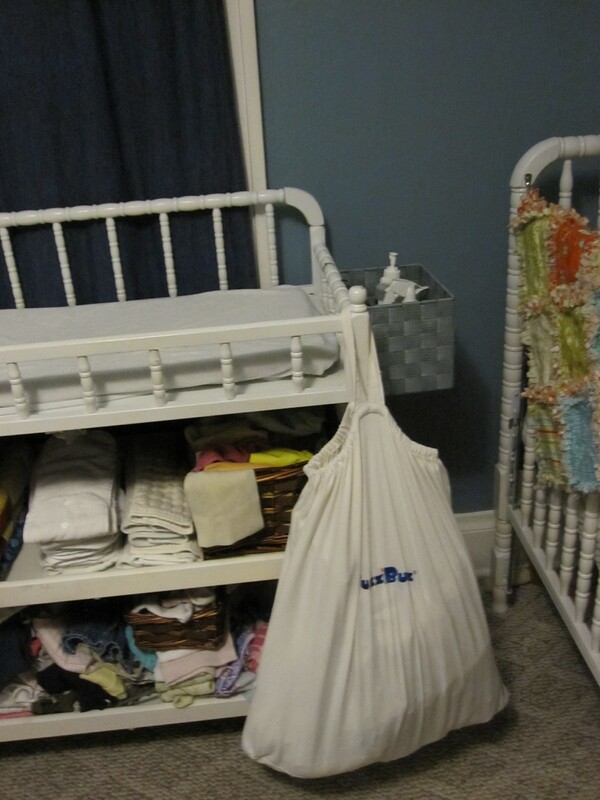 Now that I aired some of my dirty laundry, let me show you an example of an organized cloth diapering environment. This is actually my daughters room and our diapers. I decided not to post a picture of the usual ball of diapers and accessories seeing that it was not very attractive to look at. This set up looks much better, and makes me look like I have everything under control. When that little organizing bug does hit me, I have to admit I enjoy it. Having my prefolds actually pre-folded in 1/3 and ready to go is very nice. It really does make changing the diaper that much easier. I do like to keep the absorbency inserts in two separate stacks. One for microfiber inserts that are just for pockets (ones that shouldn’t go against the skin) and the second for prefolds or other fabrics that can go against the skin. I did steal my kids toy basket to hold all our covers, pockets and all-in-ones, which is nice so they are not falling on the floor all the time. Some people will have the pockets pre-stuffed and ready to go. You could go that route too if you have the organizing bug. I also just hang my fleece liners over the edge of the basket so I don’t have to dig around for them when I need them. My favorite idea so far has been this handy dandy $3 basket I purchased at a craft store. I simply tie it to the end of the changing table to keep everything I need regularly conveniently close yet out of the way of baby’s kicking legs and grabbing hands. This is the perfect spot to keep my wipes, wipe juice, booty balm and my new Bum Genius odor remover! I wish I would have thought of this 2 kids ago. I’m am currently testing the odor remover and that gets sprayed on the diaper, we just spray it on the morning diaper (as that one is always stinky), as opposed to every diaper. Normally our diapers do not smell bad, but if you’ve cloth diapered for even a little bit, you’ll notice that nighttime diaper (after being on the baby for 10-12 hours) is always stinky.